Alpha Omicron Pi Hop Raises Funds for Ruth’s Harvest | The Gettysburgian. 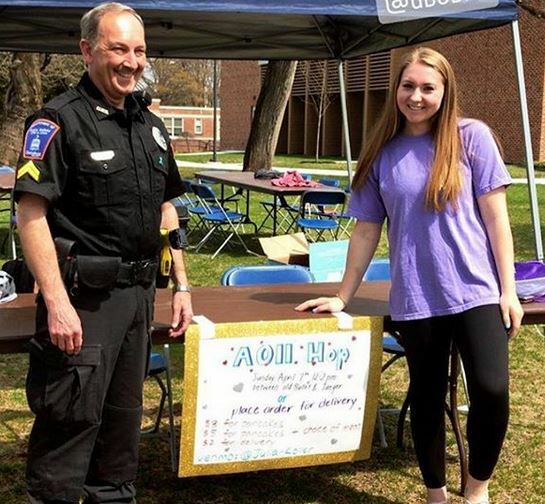 On Sunday, April 7, on the field between the Jaeger Center and the Health Center, breakfast was being served at Alpha Omicron Pi’s fundraiser, AOII Hop. This year is the second year AOII has done this fundraiser, and it was another successful event. A week prior to the fundraiser, tables were set up in CUB for students to preorder their breakfast for pickup or delivery on Sunday at the field. Each student had the choice of the traditional pancake breakfast or the more Ron Swanson-style breakfast of bacon and sausage. During the event, AOII sisters played giant Jenga and spent time together as they waited to deliver or prepare pancakes for hungry customers. AOII raised $372, according to Jaime Dougherty ’21, Philanthropy Chair of the sorority. The money generated from the fundraiser will go to Ruth’s Harvest, a charity that works to provide meals to children from impoverished families in the Gettysburg community. With this event, AOII hopes to “increase student participation on campus to do service or support a charity,” according to Dougherty.